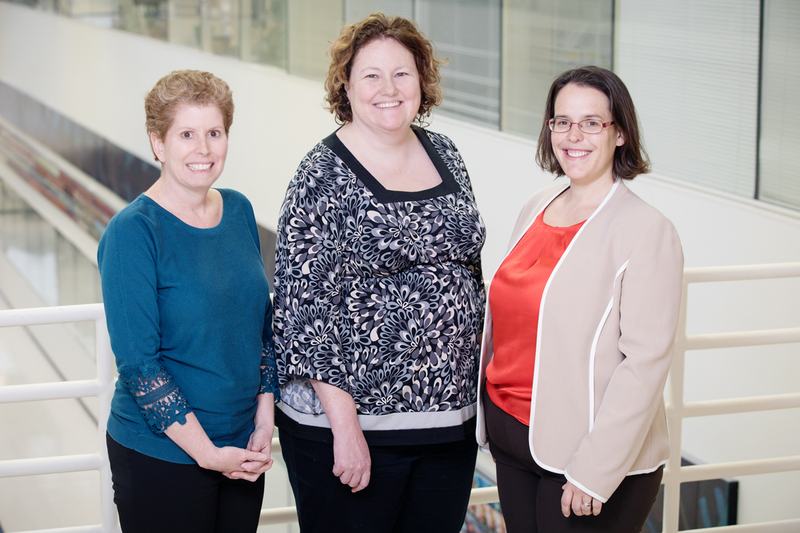 Illinois professors, from left, Jodi Flaws, Megan Mahoney and Rebecca Smith found that sleep problems in menopause are closely correlated with hot flashes and depression, but that they may not last after menopause. CHAMPAIGN, Ill. — Sleep disruptions are one of the most commonly reported complaints among menopausal women. A new study of middle-aged women found that sleep problems vary across the stages of menopause, yet are consistently correlated with hot flashes and depression. The findings suggest that addressing those risk factors may also address sleep disruptions, as well as give women hope that their sleep symptoms may not last past the menopausal transition, said Rebecca Smith, a professor of pathobiology at the University of Illinois at Urbana-Champaign. Smith conducted the study with Jodi Flaws and Megan Mahoney, professors of comparative biosciences at Illinois. The Illinois group used data from the Midlife Women’s Health Study, which followed 776 women aged 45-54 in the greater Baltimore area for up to seven years. The women provided annual surveys and blood samples so that the researchers could track sleep disruptions, other menopausal symptoms and hormone levels as women transitioned from pre- to post-menopause. To track poor sleep, the surveys asked questions about the frequency of insomnia, restless sleep and sleep disturbances. The study found no correlation between the likelihood of reporting poor sleep before menopause, during menopause and after menopause. This means that, for many women in the study, their reported sleep problems changed as they transitioned to different stages of menopause. For example, women who had insomnia during menopause were not more likely to have insomnia after menopause. In analyzing the surveys for any other symptoms or factors that might be associated with poor sleep, the researchers found that hot flashes and depression were strongly correlated with poor sleep across all stages of menopause. Those two risk factors vary in reported frequency across menopausal stages, which might help explain why poor sleep also varies across the stages, the researchers said. To further study factors affecting sleep in menopause, Mahoney is partnering with Carle Foundation Hospital in Urbana, Illinois, to recruit women for a study on how endocrine-disrupting chemicals in the environment might affect menopause symptoms. Such chemicals are found in a variety of plastics and household goods, and women are exposed to them every day, Mahoney said. The study was published in the journal Sleep Medicine. The National Institutes of Health and the Carle Illinois Collaborative Research Seed Program supported this work. Editor’s notes: To reach Rebecca Smith, call (217) 300-1428; email: rlsdvm@illinois.edu. To reach Megan Mahoney, call (217) 333-7578; email: mmm1@illinois.edu.